Did you know it took DNA testing to discover that pandas are actually bears? To the untrained eye, panda bears seem pretty straightforward. They’re cute, cuddly, and known across the world as a symbol of conservation, friendship and Chinese culture. But did you know that scientists weren’t even certain pandas were bears until the 1980s? And unlike their black bear cousins, pandas don’t hibernate! In fact, these lovable animals have a rich history. When Richard Nixon visited China in 1972, Chinese leader Chairman Mao gifted him with two pandas named Ling-Ling and Hsing-Hsing. Millions visited the friendship symbols at the National Zoo in Washington, D.C. until they died in the 1990s. Read on for more fun and fascinating panda facts you definitely didn’t know! What Is A Panda, Anyway? This sounds like a trick question — a panda is a bear. But scientists couldn’t actually confirm that until recently. For a long time, scientists weren’t quite sure what to make of the panda. The animal shares characteristics with other bears, but it also has some genes in common with raccoons. Scientists didn’t study the animal’s DNA until the mid-1980s. The findings were published in a 1985 edition of the journal Nature. If you read this thinking that pandas are actually raccoons, you’re not totally off-base. Red pandas, relatives of the black and white bear, are also related to raccoons. The two animals are a similar size, and they share a striped tail. Giant pandas are born white and typically develop their distinctive markings later in life, according to National Geographic. The animals generally grow up to be four or five feet tall and weigh up to 300 pounds. They have a lifespan of up to 20 years in the wild, and pandas can live about 10 years longer in captivity. 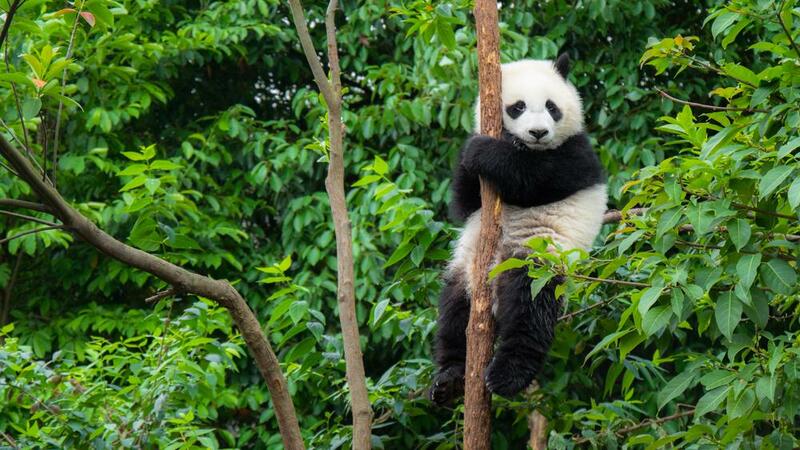 Skilled tree climbers and efficient swimmers, pandas have elongated wrist bones, which work much like thumbs. This extra appendage helps them hold their beloved bamboo. A group of pandas is called an embarassment. Seriously. It sounds even more bizarre when you consider that it’s unlikely to find an embarassment of pandas in the wild. The bears are actually solitary creatures who prefer to spend their time alone, munching on bamboo. Pandas have a keen sense of smell that they uses to sense when a fellow panda is nearby. They typically use this heightened sense to avoid other animals or find food. When it’s mating season, however, all bets are off. Every spring, male pandas use their incredible sense of smell to sniff out females to mate with. Despite the pervasive myth that pandas are bad at breeding, they are actually quite effective. One study from 2004 suggests that female pandas in the wild give birth every other year, and 60% of cubs survive past their first year. After a five-month pregnancy, the female gives birth to a cub or two in August or September. Baby pandas are born blind and bald, and they are about the size of a stick of butter, according to the San Diego Zoo. Giant pandas live in the forests and mountains of Central China, inside the Sichuan, Shaanxi, and Gansu provinces. These cool, wet forests of the mountainous regions are full of bamboo for the bears to munch on. 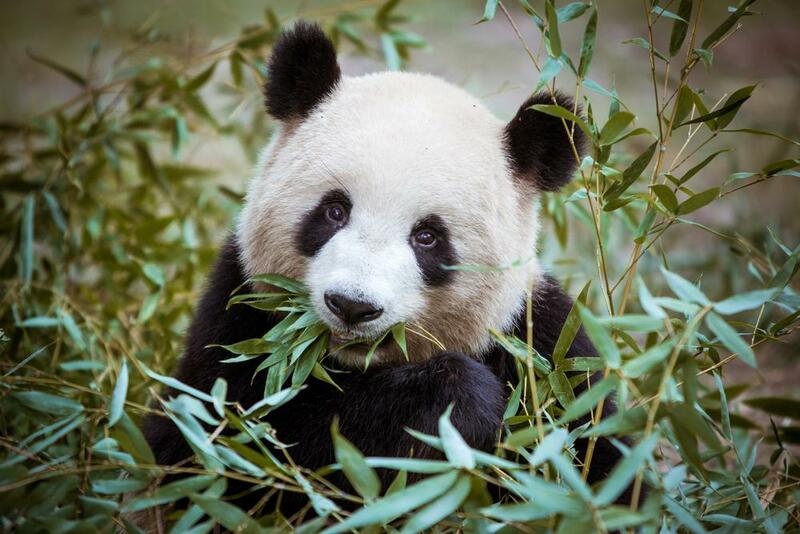 Pandas have the digestive system of a carnivore, but they’re largely vegetarian. 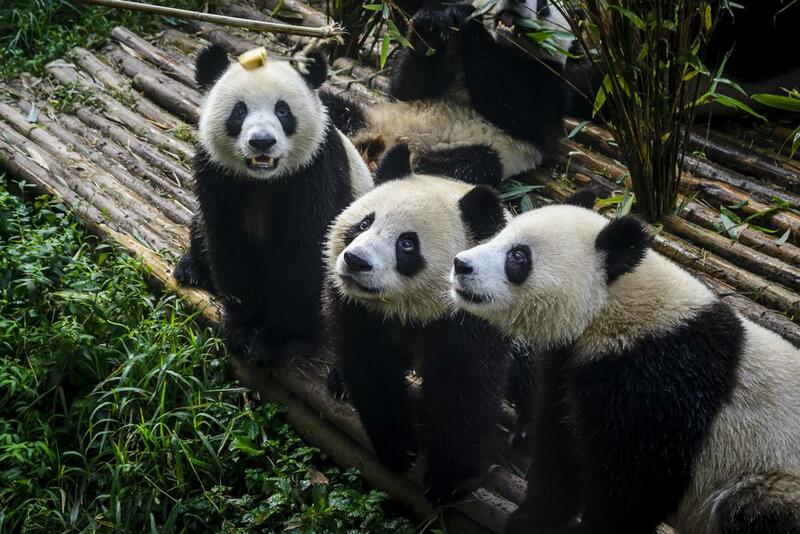 Their diet is 99% bamboo, though they will occasionally eat birds or rodents, according to National Geographic. These bears can’t digest cellulose very well, so they have a voracious appetite. Pandas have been known to eat up to 12 hours a day, consuming up to 28 pounds of bamboo. Because they can’t stop eating, giant pandas also can’t hibernate. The low nutritional value of their favorite food keeps them from building up the reserves needed to last them through the bitter winter months. This is also why they live largely low-energy lifestyles. Instead of hibernating, giant pandas climb to higher and lower elevations as the seasons change. In the summer months, they can climb up to 13,000 feet in the mountains to find food. Laid-back vegetarians, pandas seem like the ultimate bros. 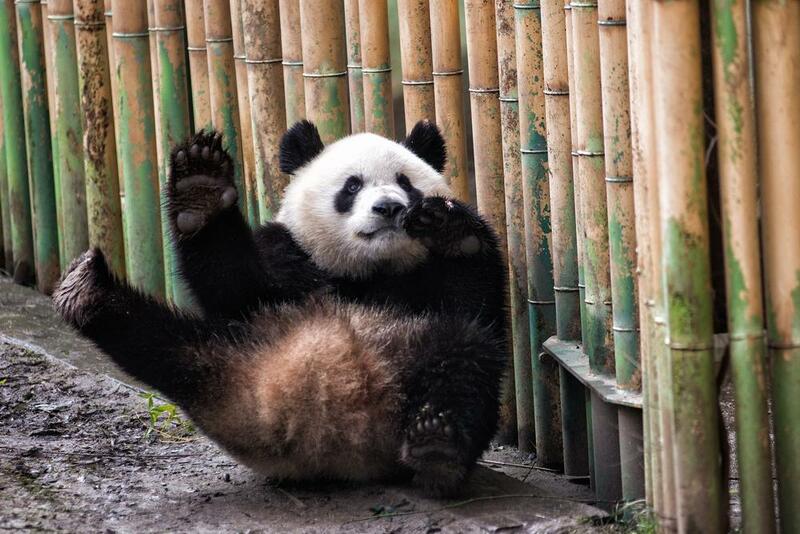 But make no mistake — pandas are still bears. While pandas typically avoid confrontation, they will fight back if provoked. Just like black bears, grizzlies, and other bears, pandas are built to be aggressive with sharp teeth, powerful jaws, and strong claws. They will fight when they’re establishing dominance or competing over a female. In fact, the first captive-born male reintroduced into the wild died after losing an apparent fight with another panda in 2007. While they can occasionally be aggressive with each other, pandas don’t typically attack humans. However, caretakers generally won’t enter a panda enclosure when the animals are there. In 1984, a panda named Ling-Ling bit a zookeeper at the National Zoo. The zookeeper turned around after taking a few steps into Ling-Ling’s yard, but that was enough time for the panda to attack his ankle, chest, arm, and back. Yikes! 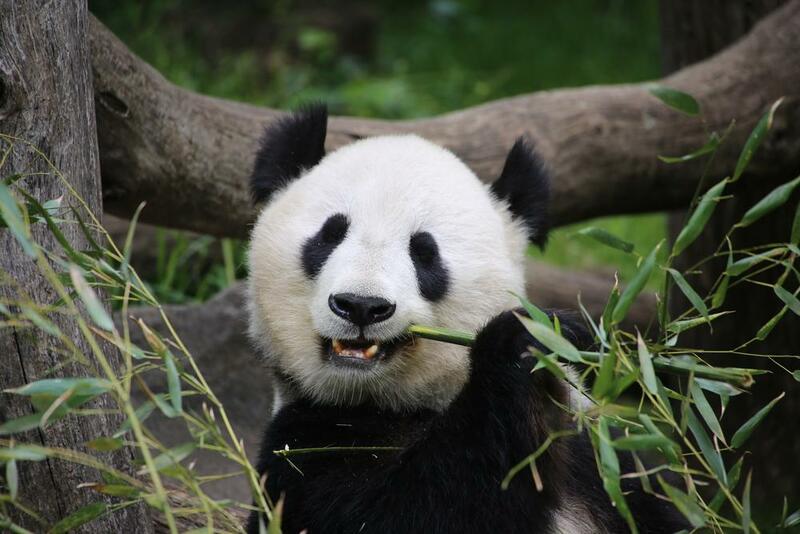 Because of their strong natural features, pandas don’t have many natural predators. Jackals, snow leopards, and yellow-throated martens are some of the brave few animals that try to prey on pandas. Humans are the greatest threat to pandas. 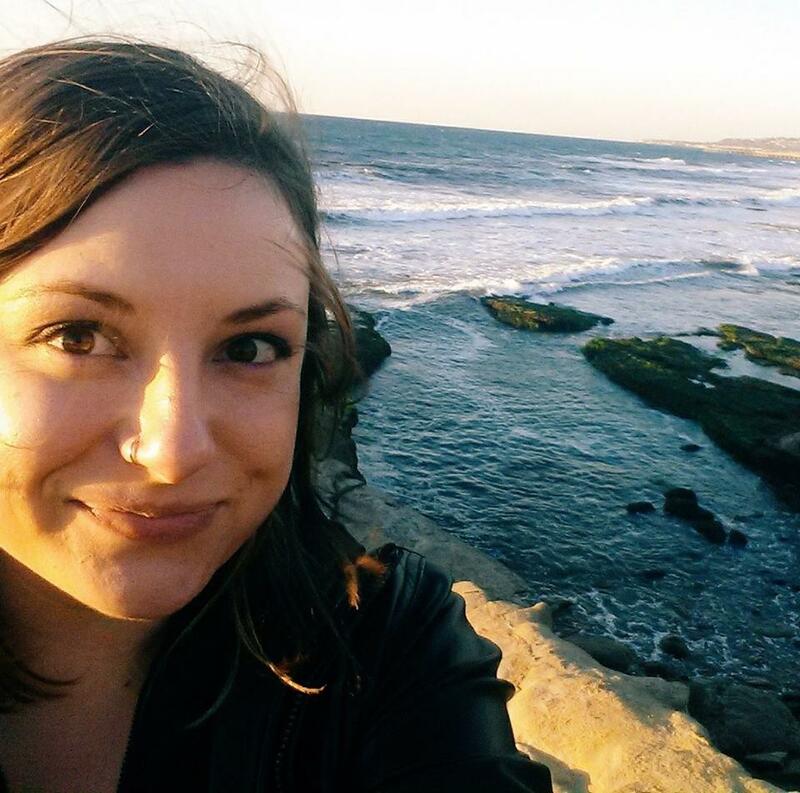 As the human population grows, people encroach on natural habitats, pushing pandas into a smaller and smaller range. Between 1974 and 1989, human activity destroyed half of the panda’s habitat in China’s Sichuan province. Largely because of this destruction, panda bears earned a spot on the endangered species list in 1990. In the past two decades, they’ve staged an amazing comeback. In 2014, the World Wildlife Fund estimated there were 1,864 giant pandas in the wild, which is up 17% from the decade before. That number doesn’t include cubs under 18 months. Two years later, the International Union for Conservation of Nature downgraded their status. Today, pandas are considered threatened, and they are no longer endangered. Climate change still poses a significant threat to the giant panda. Rising global temperatures could wipe out more than 35% of bamboo forests in China, according to the IUCN. If the panda’s food source goes, so do they. Giant pandas are no longer standing at the cliff of extinction, but they’re not totally out of the woods. If we don’t start taking climate change seriously, we could lose this icon of conservation forever. "Pandas have been known to eat up to 12 hours a day, consuming up to 28 pounds of bamboo." Common soaps contain phosphate, surfactants, and triclosan, which can harm aquatic life after they’re poured down the drain.